Angelina Finau, Fulbright English teaching assistantship award recipient. Photo courtesy of Angelina Finau. Angelina Finau. Photo by Lee Choo. 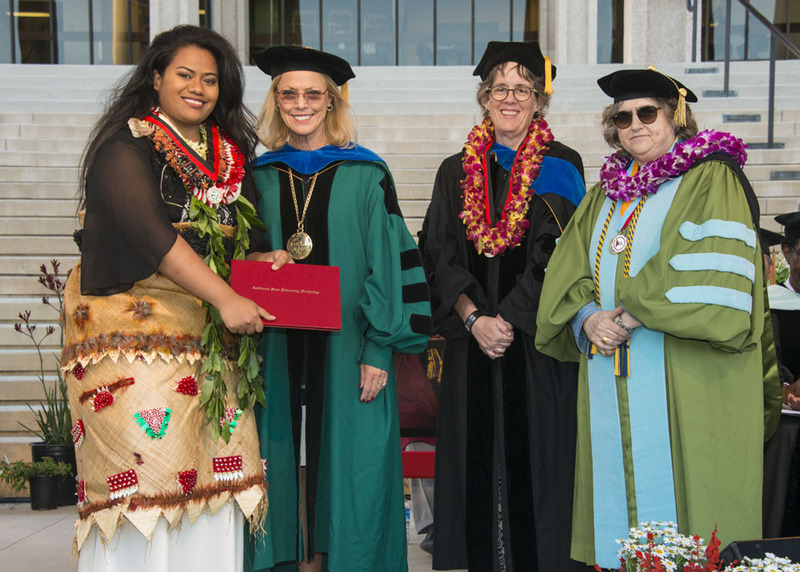 Angelina Finau at her Honors Convocation in 2017. Photo by David J. Hawkins. 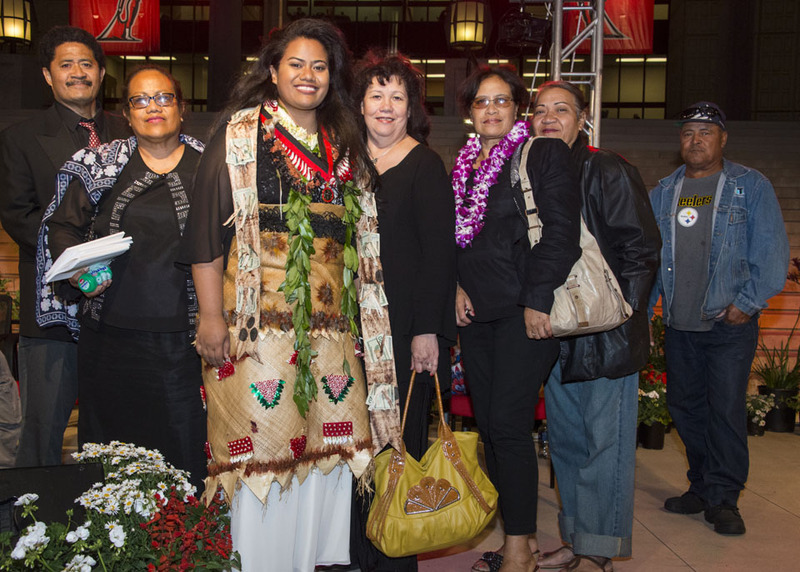 Angelina Finau in traditional Tongan wardrobe with her family at Honors Convocation in 2017. Photos by David J. Hawkins. 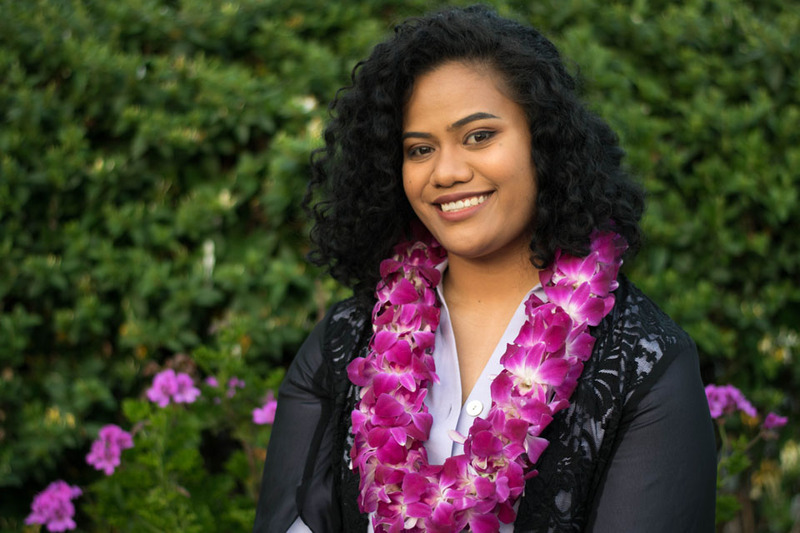 Angelina Finau, a California State University, Northridge alumna and scholar, credits her success to her family and Tongan roots. Finau ’17 (Political Science) believes she is a non-traditional person, in part due to her parents’ immigration to the United States in the 1980s. Their “go-get-it attitude” taught Finau to challenge herself, she said. Located in the South Pacific, with a population of 107,122 people across 40 inhabited islands, the Kingdom of Tonga is a tropical island nation known for its welcoming people. This may explain Finau’s relentless gratitude and kindhearted manner. Through Fulbright’s English Teaching Assistant Program, Finau will provide assistance to English teachers in South Korea while serving as a cultural ambassador for the U.S.
Finau learned about her Fulbright award and assignment to South Korea in April. “After everything was said and done, the best part was telling my parents — to see the joy that they have and excitement [for my] next step,” Finau said. In 2017, upon graduation, CSUN recognized Finau with the Wolfson Scholar award, the top honor given to a graduating senior. Not only must the student have an exceptional academic record, but he or she must also have made significant contributions to CSUN or to the community through co-curricular and extracurricular activities. After graduation, Finau worked for Councilwoman Nury Martinez, working to improve public safety in Los Angeles’ 6th District, which includes her native Van Nuys. 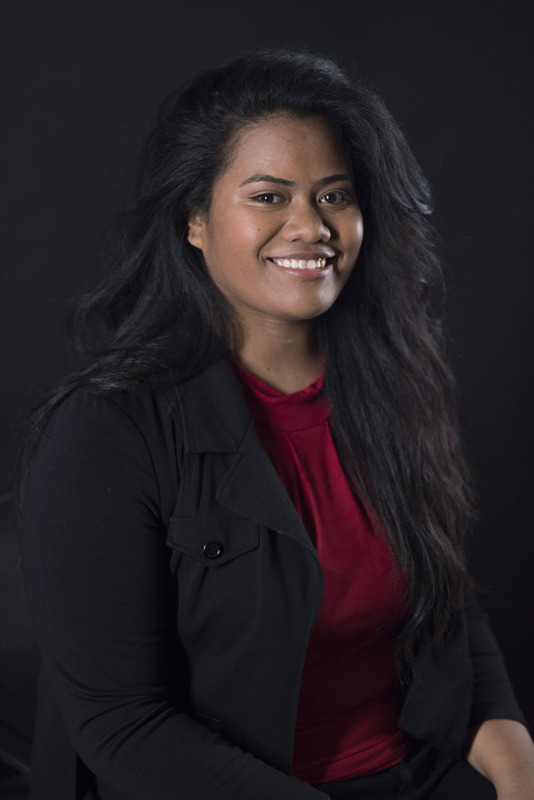 ​​In order to be considered for the Fulbright program, Finau completed a rigorous application process that included essay submissions, transcripts, a copy of her diploma, an FBI background check and approved health paperwork. Although she found out about the application just one month before it was due, Finau’s former professors encouraged her, particularly Finau’s mentor and Director of the Office of Student Success Innovations, Kristy Michaud. Finau found their support as absolutely crucial saying, “They told me to go for it – because this is the time to search out different opportunities and apply myself,” she said. That advice proved invaluable. For Finau, leaving the country is both a challenge and a reward. She has never left the country and loves her diverse home in the San Fernando Valley, but she is really excited to learn from others, she said.